The new bi-articulated chassis, Gran Artic 300, is 30 meter and can carry up to 300 passengers. Volvo Bus Latin America CEO Fabiano Todeschini is confident that the design will revolutionise public transport and be embraced by metro bus operators around the world. "We are leaders in vehicles for high-capacity transportation systems, Bus Rapid Transit, and now we introduce the world’s largest bus chassis," he says. "This vehicle will provide more efficient transportation systems, offering a higher quality for the passengers and improved cost efficiency for transport operators." The new Gran Artic 300 has been developed in Brazil especially for BRT systems – high demand transportation systems where buses run on dedicated lanes. The bus will be able to carry up to 30 passengers more than the preceding model. One bi-articulated bus of the model replaces three standard vehicles. At the FetransRio exhibition, Volvo also unveiled a new 22m articulated chassis, the Super Artic 210, which can carry 210 passengers and is equipped with five doors. The extra door facilitates boarding and alighting and also enables a better passenger distribution inside the bus. 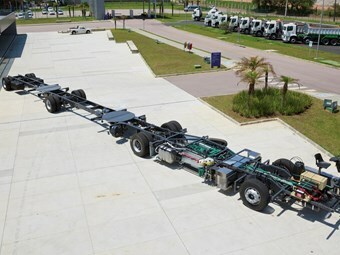 The vehicle is built on only three axles. "We are proud to say that the world’s largest bus is a Volvo and that it was developed in Brazil," Volvo Bus Latin America sales engineering coordinator Idam Stival says. Volvo is a pioneer in the development of vehicles for BRT systems and recognized as the market leader.